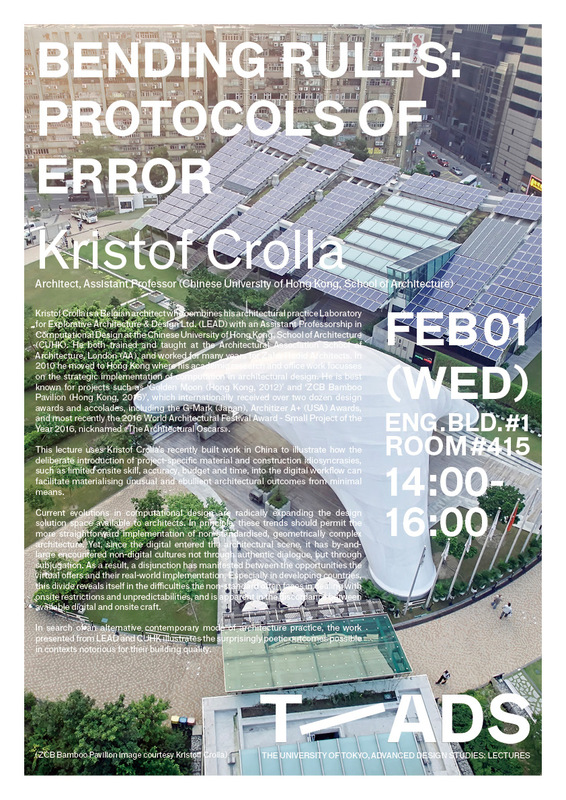 Please join us in room #415 of Engineering Building #1 for a lecture by Kristof Crolla. Mr. Crolla is an architect and is an assistant professor at the Chinese University of Hong Kong School of Architecture. Kristof Crolla is a Belgian architect who combines his architectural practice Laboratory for Explorative Architecture & Design Ltd. (LEAD) with an Assistant Professorship in Computational Design at the Chinese University of Hong Kong, School of Architecture (CUHK). He both trained and taught at the Architectural Association School of Architecture, London (AA), and worked for many years for Zaha Hadid Architects. In 2010 he moved to Hong Kong where his academic research and office work focusses on the strategic implementation of computation in architectural design. He is best known for projects such as ‘Golden Moon (Hong Kong, 2012)’ and ‘ZCB Bamboo Pavilion (Hong Kong, 2015)’, which internationally received over two dozen design awards and accolades, including the G-Mark (Japan), Architizer A+ (USA) Awards, and most recently the 2016 World Architectural Festival Award – Small Project of the Year 2016, nicknamed «The Architectural Oscars». This lecture uses Kristof Crolla’s recently built work in China to illustrate how the deliberate introduction of project-specific material and construction idiosyncrasies, such as limited onsite skill, accuracy, budget and time, into the digital workflow can facilitate materialising unusual and ebullient architectural outcomes from minimal means. Current evolutions in computational design are radically expanding the design solution space available to architects. In principle, these trends should permit the more straightforward implementation of non-standardised, geometrically complex architecture. Yet, since the digital entered the architectural scene, it has by-and-large encountered non-digital cultures not through authentic dialogue, but through subjugation. As a result, a disjunction has manifested between the opportunities the virtual offers and their real-world implementation. Especially in developing countries, this divide reveals itself in the difficulties the non-standard often faces in dealing with onsite restrictions and unpredictabilities, and is apparent in the discordance between available digital and onsite craft. In search of an alternative contemporary mode of architecture practice, the work presented from LEAD and CUHK illustrates the surprisingly poetic outcomes possible in contexts notorious for their building quality.